Over 500 people in Honduras have received medical care that would otherwise have been unavailable, thanks to the Lake Erie College community. In December 2018, 11 Lake Erie College students, alumni, and faculty went on a medical mission trip to serve El Espinito, Honduras and surrounding cities. This was made possible through Global Brigades, an international nonprofit organization which has empowered multiple villages in developing nations for over 15 years. Many of the Honduran villagers have been out of their hypertension and diabetic medications for years. Some had never received dental or vision care. It was not unusual for entire families to walk for hours to receive care. The medical mission was very successful. Over 500 people received medical care, including prescription medicine and cervical cancer screenings. Hundreds received dental screenings and extractions. Hundreds also received vision screening exams and prescriptive glasses. The Brigade also installed three eco-friendly stoves which decrease the production of soot, improving respiratory health for families. All individuals received gift bags of hygiene products and education on preventative health. 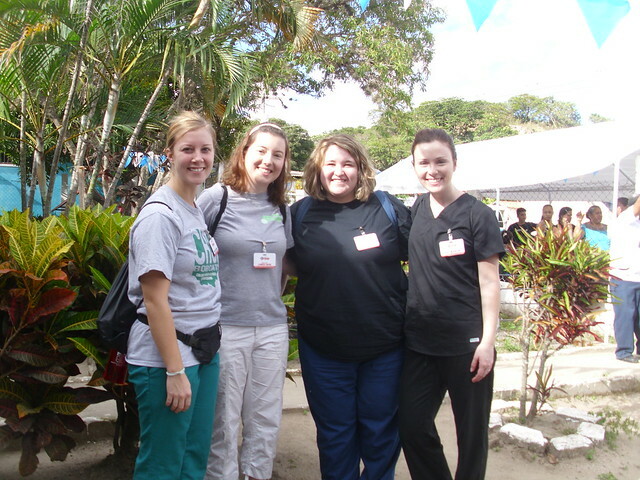 The individuals who went on the medical mission include PA Professor Sean Kramer, PA Class of 2017 alumni Joanna DeVries, current PA Class of 2019 students Jess Flowers, Kaitlin Gibson, Courtney Ownby, Candice Ramus, Abbey Skorupski, current PA Class of 2020 students Zachary Gibbemeyer, Rebecca Jaboni, Tara Tabbaa, and Lake Erie College undergraduate student Melissa Mochan. These individuals helped raise over $25,000 toward travel and medical supplies. In addition, they obtained and shipped thousands of hygiene supplies such as toothbrushes, toothpaste, floss, soap, and shampoo. Many of the generous donations were obtained by local supporters which include NDS Orthodontics (Madison, OH), William D Nelson DDS (Concord, OH), Dr. Kendra Mahaffey (Concord, OH), Erie Optical (Mentor, OH), Sleep Inn (Johnstown, PA), and Servello Orthodontics (Ebensburg, PA). In addition, the effort was supported by an oral health education grant through the NCCPA Health Foundation obtained by Professor Sean Kramer and Steven Hunter, which helped pay for many dental supplies, models, and its cost for transportation. Global Brigades and the community of El Espinito, Honduras were impressed with Lake Erie College’s professionalism and compassion for others. The feedback from the students who went on the medical mission was equally positive. There is significant interest in continuing the medical mission annually. Alumni, faculty, staff, graduate students and undergraduate students are welcome to join. No medical experience is necessary. All you need is the desire to make a difference. Please contact Professor Sean Kramer, skramer@lec.edu if interested.